Giving the sweet tooth a rest. Pancakes are really easy to whip up and to cook them. It’s versatile that you could add alot of extra things you want, to make it sweet or savoury. 1. Blitz everything in the food processor. 2. Pour into a jug and leave for about 20 minutes before using it. 3. Heat up saucepan and coat with a little butter. 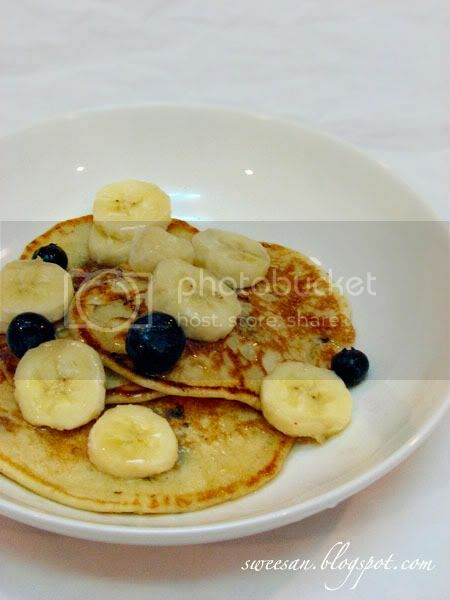 Pour pancake batter in pan and add blueberries or bananas if you want. 4. Once the upper side of the pancake is blistering and bubbling it’s time to cook the second side, and this will take about 1 min. 5. Continue till all batter has finished. Serve with maple syrup or honey and perhaps crispy fried bacon or something. Nice looking pancake. Were they sausages in the last picture???? 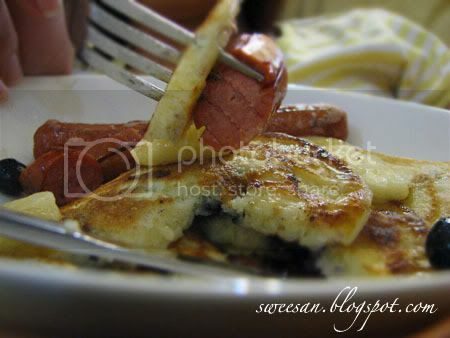 Hot dog pancake? lol!! !